Av. San Fernando #22 Col. Sección XVI, D.F. This is a case of a 52-year-old female who was admitted in our Hospital with abdominal pain and epigastric discomfort, findings on the physical examination were palpable mass on right hypocondrium and mild tenderness. She did not have history of other comorbidities. The Ultrasonography and CT scan findings were: a well-circumscribed tumor arising from the right hepatic lobe, diameter of 90 mm, compressing other abdominal structures, suggesting as a possible diagnostic and hepatic hemangioma (Figure 1). Initial management was CT-guided angioembolization (two sessions). After this management, she presented a mild relief of the symptoms. A new CT scan revealed a mild reduction on tumor´s size; location of the lesion suggested a tumor arising of the head of the pancreas with clear borders, attenuation values of 18-27 Hounsfield units, heterogeneous enhancement and vascularity present within, the adjacent organs were compressed, and no enlarged lymph nodes were found (Figure 2). Laboratory tests, tumor markers (CEA and CA19-9) and gastric endoscopy were normal. Endoscopic ultrasound was not available in our institution. At this scenario, lacking of biopsy, high suspicious of malignancy, the patient´s symptoms and because the tumor´s size, we decided to perform a pylorus preserving pancreatoduodenectomy; there was a total bleeding of 400 ml and surgical time of 5 hours. It was no need for ICU admission and transfusions. No surgical complications were reported. Before discharge of our service, patient presented seizures secondary to arteriovenous malformation in frontal lobe found in brain CT and MRI; she had no previous history of neurologic symptoms. Diagnostic and therapeutic protocol was in charge of Neurology and Neurosurgery department, but she died one month after the surgery. Histopathological findings were: hemolymphangioma of pancreatic head; with a size of 8x6.5x6 cm; solid component with focal mucinous cysts. No invasion to others structures were reported. Peripancreatic lymph nodes were normal (Figure 3). 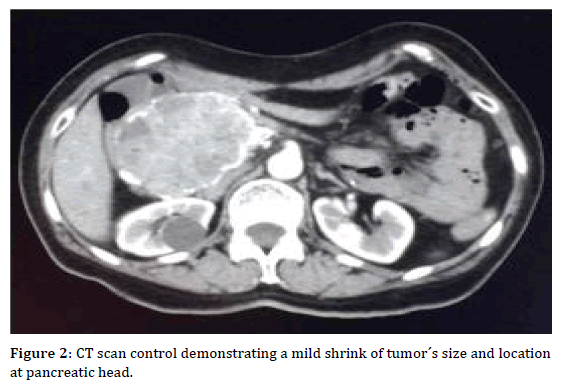 Figure 1: A. CT scan demonstrates a heterogeneous mass, initially was suspected to be a hepatic hemangioma. B. 3-D reconstruction shows a highly vascularized mass, which is suitable for the head of the pancreas. Figure 2: CT scan control demonstrating a mild shrink of tumor´s size and location at pancreatic head. Figure 3: Histological microphotography (Hematoxylin and eosin stain, 4x/0.10), we can see normal pancreatic tissue (acini and duct) and a soft tissue lesion delimited by fibroconnective tissue (pseudocapsule). 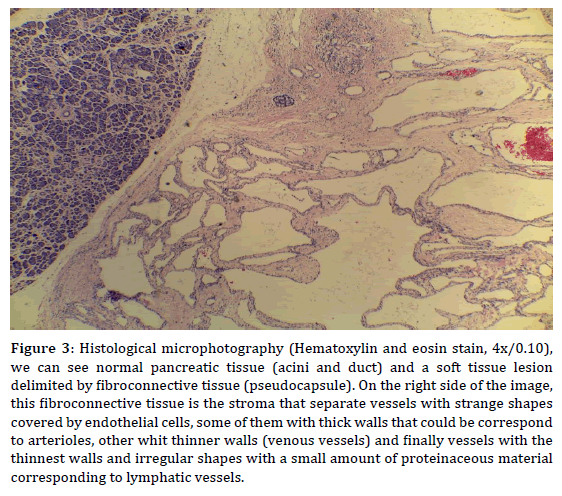 On the right side of the image, this fibroconnective tissue is the stroma that separate vessels with strange shapes covered by endothelial cells, some of them with thick walls that could be correspond to arterioles, other whit thinner walls (venous vessels) and finally vessels with the thinnest walls and irregular shapes with a small amount of proteinaceous material corresponding to lymphatic vessels. Pancreatic hemolymphangioma is an uncommon cystic benign tumor. Lymphangiomas are benign malformations, the classification consists of four distinct types according to the depth and the size of abnormal lymph vessels: capillary or “circumscriptum” lymphangioma, cavernous lymphangioma, cystic higroma and finally, when associated with blood-filled vascular lacunae, they appear morphologically as more variegated structures termed hemolymphangioma. Hemolymphangiomas are mostly presented as cystic or cavernous lesions . These tumors develop in the orbit, tongue, neck, mediastinum, pancreas, spleen, liver, adrenal gland, retroperitoneum and extremities; gastric involvement is very rare . Hemolymphangioma is thought to originate from the mesenchymal tissue. It may be divided into primary and secondary lymphatic vascular tumors. The primary tumor is considered to be a congenital malformation of the lymphatic vascular system. The formation of this tumor may be explained by obstruction of the venolymphatic communication between dysembryoplastic vascular tissue and the systemic circulation. The secondary tumor is caused by poor lymph drainage and lymphatic damage resulting from surgery or trauma . Its incidence varies from 1.2 to 2.8 per 1000 newborns . 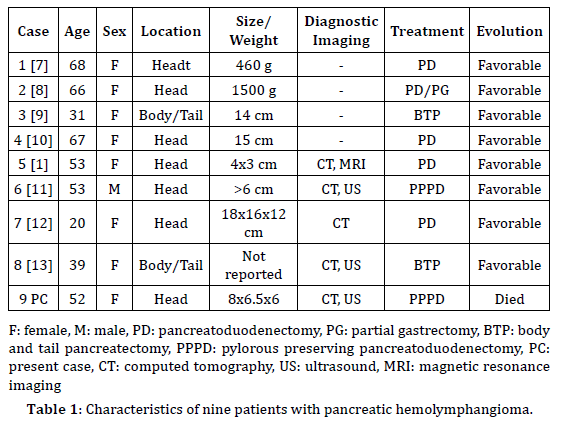 There are only eight cases reported on pancreas previously (PubMed) [1, 7-13] and characteristics are showed in Table 1. The pancreatic hemolymphangioma is most common in women (8 in this series) and the most common location were the head of the pancreas observed in seven cases. Macroscopically are large lesions, with a thin wall having multiple septa with varying size cystic cavities containing fluid similar to hemorrhagic and rarely of clear lymphatic nature as can see on our images. Microscopically, the tumor consists of abnormal lymphatic and blood vessels with polycystic spaces. These cysts have connective septa covered by endothelium, and sometimes, adipose or interstitial fibrous tissues surround the tumor [1, 6]. Patient can be asymptomatic for a long time until the tumor grown enough to cause symptoms as we seen in our patient. The clinical diagnosis is not often due to its rarity and the absence of clinical expression; in our case it was delayed until the surgery. Abdominal pain and awareness of an abdominal mass are the most common symptoms . Other infrequent symptoms such as vomiting, nausea and early satiety are caused by occupied tumor. Pedicle torsion pain simulates adnexa torsion. 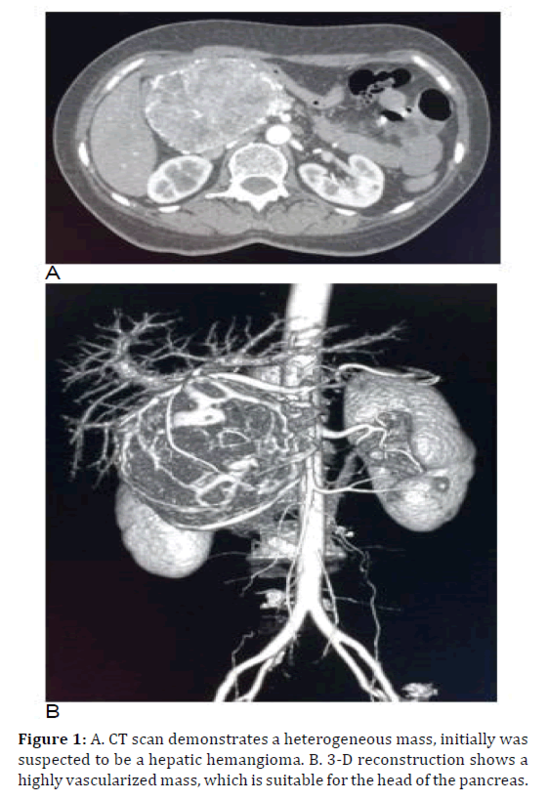 In two cases, the chief complaint was severe anemia caused by duodenal bleeding because the hemolymphangioma of the pancreas invaded to the duodenum however it was discarded on the present case and this situation is extremely rare . In our case, main complaints were abdominal pain and early satiety and palpable mass in the physical examination. Laboratory tests are frequently normal including tumor markers. Vascular markers, such as CD31, CD34 and factor VIII, cytokeratins marking epithelium and the lymphatic marker D2-40 are available but its use is only reported in other vascular pancreatic tumors, like hemangiomas . Endoscopic Ultrasonography is recommended because of its characteristic findings and anechoic mass with clear edge however in our institution this diagnostic option was not available. CT and MRI are useful in defining the extent and the invasion of the mass, and planning the surgical strategy . CT findings of pancreatic hemolymphangioma typically show a mass with heterogeneous enhancement . On MRI, hemolymphangiomas like lymphangiomas and most vascular malformations demonstrate hyperintense signal intensity on T2-weighted and turbo short T1 inversion recov¬ery images. The masses demonstrate peripheral and septal en¬hancement after administration of gadolinium . In our case, based in CT scan, the tumor initially was diagnosed as a hepatic hemangioma, and we used CTguided angioembolization as a therapeutic modality. CT control showed a mild shrink in tumor´s size and location at the head of the pancreas but the patient kept symptomatic. Preoperative angioembolization of hyper-vascular tumors is well documented for renal cell carcinoma, spinal tumors and osseous renal cell carcinoma metastasis. This strategy was proven safe and may result in decrease risk of bleeding during surgery and increase operative safety. 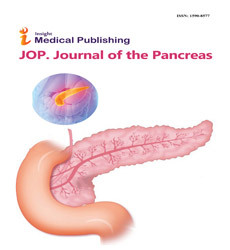 Preoperative embolization of primary pancreatic cancer was rarely described in the literature. Hirose et al. reported a giant tumor safely resected after preoperative angioembolization. Preoperative angioembolization of the hepatic artery prior to en block celiac axis resection for pancreatic body cancer was also reported . There are no previous reports using angioembolization therapy in vascular pancreatic tumors, but we consider that it was a serendipity safe therapeutic option. In our case, reduced the size of the tumor and made surgical management easier, with minimal bleeding and no need to transfusions however it needs further investigation. The impossibility to preoperatively define the histological type of the tumor explains the difficulties to reach a correct differential diagnosis. Biopsy should not be performed because of the high risk of massive bleeding. It is very important and crucial for radiologists to recognize these lesions and establish an accurate diagnosis so as to avoid a biopsy, which could cause severe hemorrhage . There is one report of a CT guided biopsy in a chest wall hemolymphangioma with no further complications, but the author comments that fine-needle aspiration biopsy may lead to misdiagnosis of the disease . Clinical differential diagnoses includes pseudocyst, lymphangioma, serous from mucinous tumors, sarcoma, enteric duplication cyst, and cystic tumor not otherwise specified (Figure 4). The final diagnosis is based on a combination of clinical, radiological, and histopathological findings. 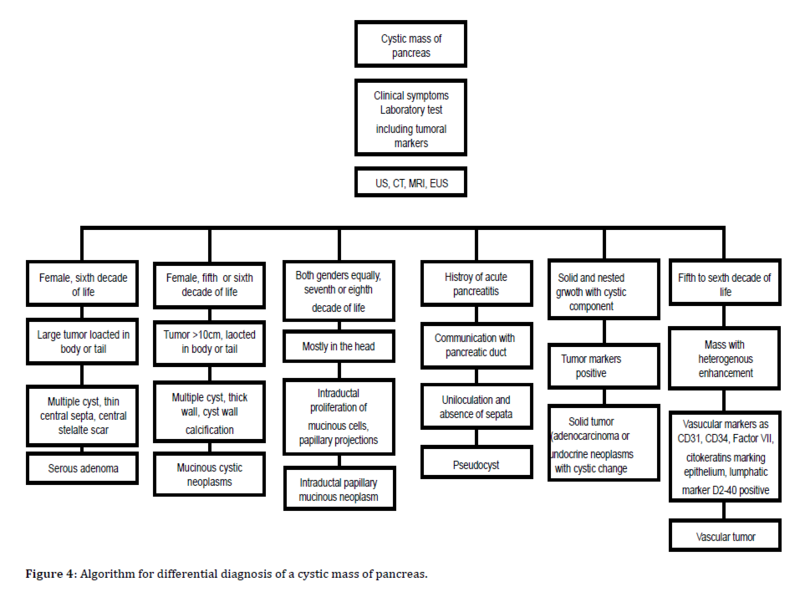 Figure 4: Algorithm for differential diagnosis of a cystic mass of pancreas. Surgery is required to treat this tumor. There are two operative modalities: cystectomy and partial pancreatectomy. Because the diagnosis is made postoperatively, pancreatoduodenectomy is typically used for the suspicion of malignancy or invasion . There are no reports of laparoscopic management of these malignancies; instead there is one case report of a successful laparoscopic splenectomy for spleen hemolymphangioma . There is one report of endoscopic removal of a gastric hemolymphangioma . All cases in the literature had good prognosis. Instead, in our case, after the surgery, patient presented tonic-clonic seizures, and it was diagnosed with an arteriovenous malformation in frontal lobe found on CT and MRI. She died one month after surgery due to complications secondary to status epilepticus. Despite its low frequency, hemolymphangioma should be taken into account when a multilocular cystic mass of the pancreas is evaluated.